Using infrared data from the Subaru Telescope in Hawaii, an international team of astronomers has imaged a giant planet around the bright star GJ 504. About four times the mass of Jupiter and similar in size, the new world, dubbed GJ 504b, is the lowest-mass planet ever detected around a star like the sun using direct imaging techniques. 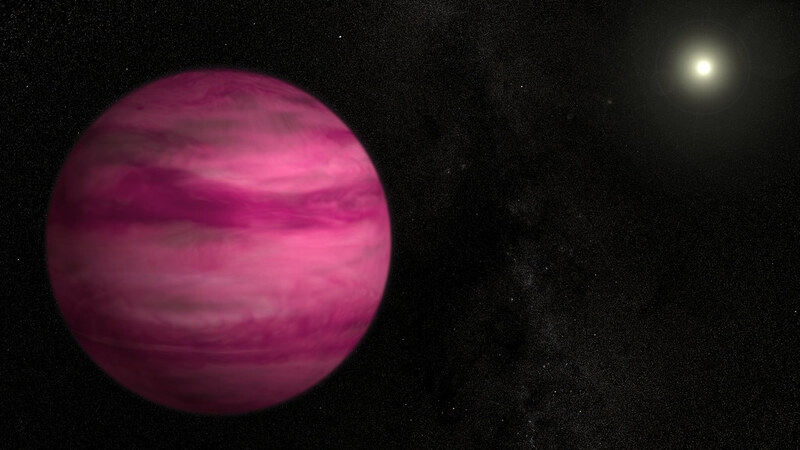 “If we could travel to this giant planet, we would see a world still glowing from the heat of its formation with a color reminiscent of a dark cherry blossom, a dull magenta,” said Michael McElwain, a member of the discovery team at NASA’s Goddard Space Flight Center in Greenbelt, Md. Posted in Artwork, Big Picture, Photography | tagged astronomy, exoplanets, NASA, pink, planets, science, space, space exploration, spheres. The permalink.